Published in Nature Communications, the work saw the Griffith team, led by Professor Geoff Pryde, working with photons (single particles of light) and using them to measure the extra distance travelled by the light beam, compared to its partner reference beam, as it went through the sample being measured—a thin crystal. The researchers combined three techniques—entanglement (a kind of quantum connection that can exist between the photons), passing the beams back and forth along the measurement path, and a specially-designed detection technique. “Every time a photon passes through the sample, it makes a kind of mini-measurement. The total measurement is the combination of all of these mini-measurements,” said Griffith’s Dr. Sergei Slussarenko, who oversaw the experiment. “The more times the photons pass through, the more precise the measurement becomes. “Our scheme will serve as a blueprint for tools that can measure physical parameters with precision that is literally impossible to achieve with the common measurement devices. Lead author of the paper Dr. Shakib Daryanoosh said this method can be used to investigate and measure other quantum systems. “These can be very fragile, and every probe photon we send it would disturb it. In this case, using few photons but in the most efficient way possible is critical and our scheme shows how do exactly that,” he said. While one strategy is to just use as many photons as possible, that’s not enough to reach the ultimate performance. For that, it is necessary to also extract the maximum amount of measurement information per photon pass, and that is what the Griffith experiment has achieved, coming far closer?to the so-called Heisenberg limit of precision than any comparable experiment. The remaining error is due experimental imperfection, as the scheme designed by Dr. Daryanoosh and Professor Howard Wiseman, is capable of achieving the exact Heisenberg limit, in theory. A few extra steps are required before this proof-of-principle demonstration can be harnessed outside the lab. Producing entangled photons is not simple with current technology, and this means it is still much easier to use many photons inefficiently, rather than each set of entangled photons in the best way possible. However, according to the team, the ideas behind this approach can find immediate applications in quantum computing algorithms and research in fundamental science. 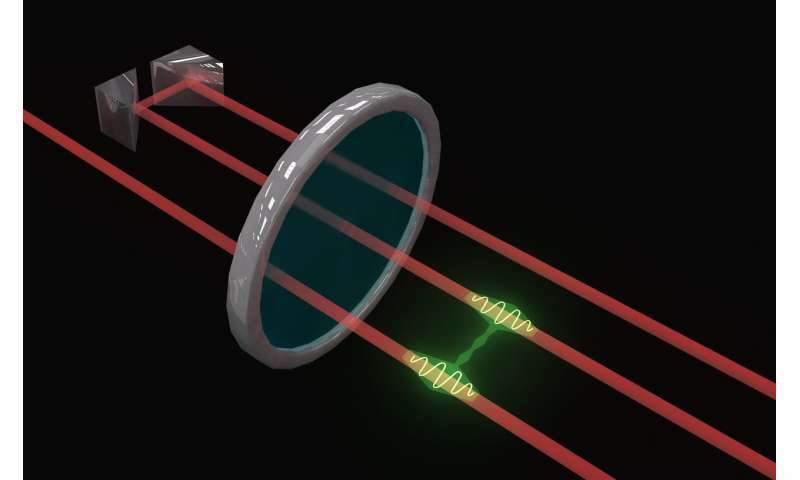 The scheme can ultimately be extended to a larger number of entangled photons, where the difference of the Heisenberg limit over the usually achievable limit is more significant.